Dinosaur teeth on a lens cap. 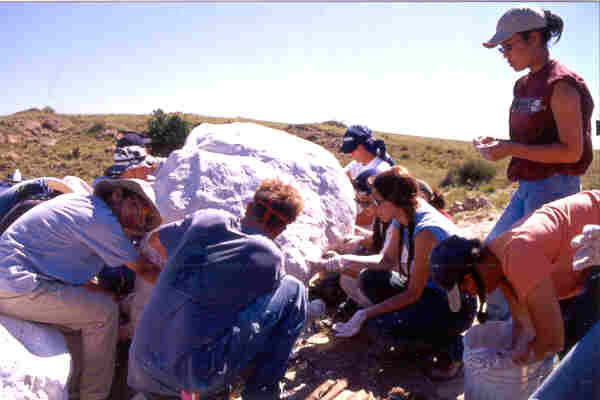 As we continued hunting dinosaurs we were joined by a film crew from National Geographic News who were most interested in the "rex blocks" so our two groups went out together and with Gabe, Paul and Allison directing, we went out to collect the tyrannosaur. Paul shows the body line to the class. Since two of the blocks were resting on top of another block, Paul figured out how to move them apart to make them easier to plaster. Here Paul's showing Marco, Gina, Stephanie, Lindsey, Allison and Carol the borderline between the inside of the tyrannosaur and the matrix which surrounds it. Then it was time to start wrapping and plastering. First the blocks were wrapped in aluminum foil to protect surface bone and detail. Then plaster was mixed by hand and applied to wet strips of burlap and bits of 2x4 and scrap wood which would protect the blocks during transport. Starting to plaster the rex blocks. The biggest block had to be turned over so that we could plaster the other side. As the cameras rolled, Chad towed the block over with his pickup truck while Arlene watched. As the block came to rest upside down, she whispered, "I always wondered what was on the bottom of it" and choked up. She said she'd be sorry to see these blocks go; they'd been a major part of her landscape ever since she arrived at Zerbst Ranch as a young bride many years ago. Done with the big block. Now that we could reach the other side, our class finished the plastering and made a frame to support this block which weighed about two tons. 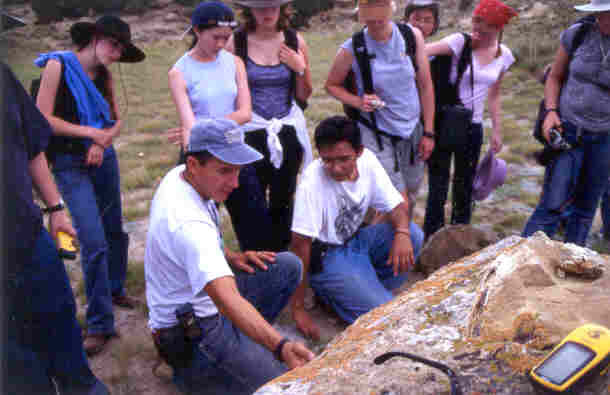 Then the plaster had to harden before the blocks could be moved, so we took our groups out prospecting one last time. But we had worn out the film crew. 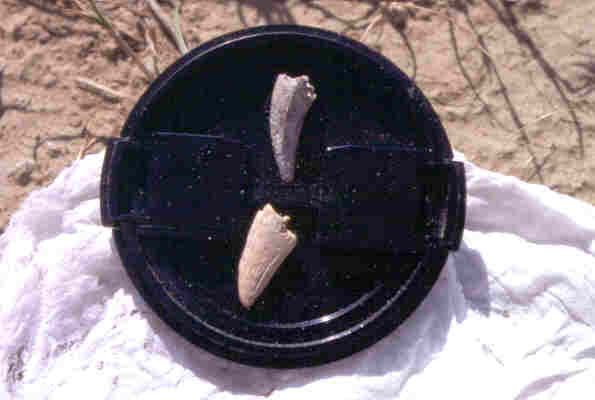 After they did an interview with Sara at her horn core site, they went back to Paleo Park for a sitdown and a cold brew. Bright and early the next day, the National Geographic crew and the University of Chicago team assembled to put the blocks on the Paleo Park flatbed truck. Chad, the king of tows, now became the boss of the backhoe. 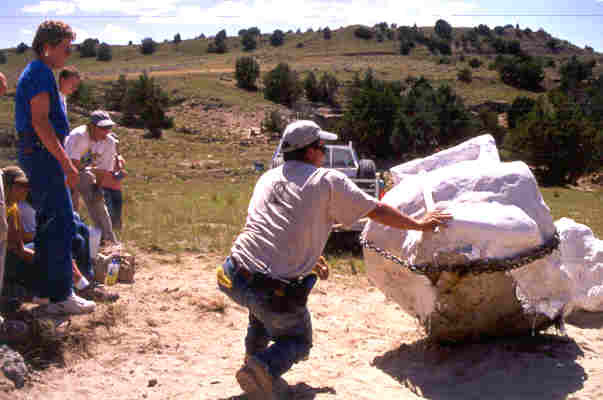 All the Park's chains were assembled and the first block was wrapped up in chain and the backhoe pulled up. The block slipped, so down it went. The chains were fixed, then it went up and onto the truck. Putting the blocks on the flatbed. Only the four smallest blocks fit on the flatbed. The students and I lifted the smallest one on by hand. We just picked it up and put it on there. Amazing what you can move when you have 20 hands! The downside of all this, was that it meant our trip was coming to an end. Gabe gave awards to all the Advanced Paleo students and we gave gifts to Arlene, Kris, Chad and Briley. 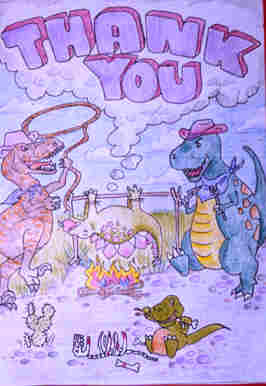 Carol drew a wonderful card for our hosts and everybody signed it. They tried to figure out which dinosaur represented which person at Paleo Park. Briley felt she must be the one twirling because she had taught some of our group how to twirl rope. But Carol said that she didn't really think of each one of them as a dinosaur, just distilled her Wyoming experiences into the drawing. Paul signed the back of Briley's t-shirt and she asked everyone else to do the same. We smiled, we laughed, we applauded; but inside we were crying because we knew it was our last night at Paleo Park. The next day, after many group pictures of Advanced Paleo Students, our hosts and our group, we got ready to go. 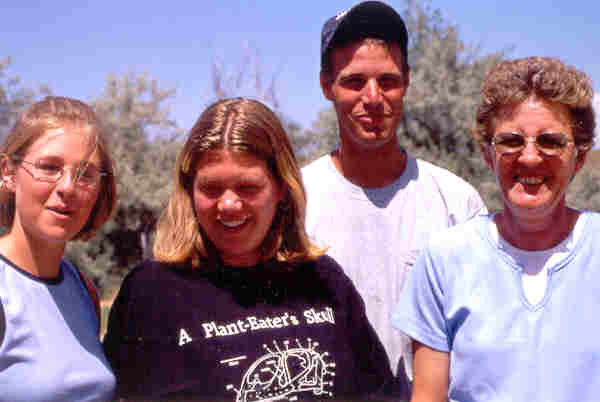 Left to right: Briley, Kris, Chad and Arlene. I was joking with Arlene and said that "next year we should bring elephants so she'd really have a three ring circus!" She said we'd been "a handful" but that she was "really going to miss us." Later, when we called, she said the Ranch was too quiet. Chad said that if we come back next year, he's going to buy a blue tow truck so that he doesn't wreck his pickup pulling us out of the mud! What did we take away from this? None of the students or the t.a. 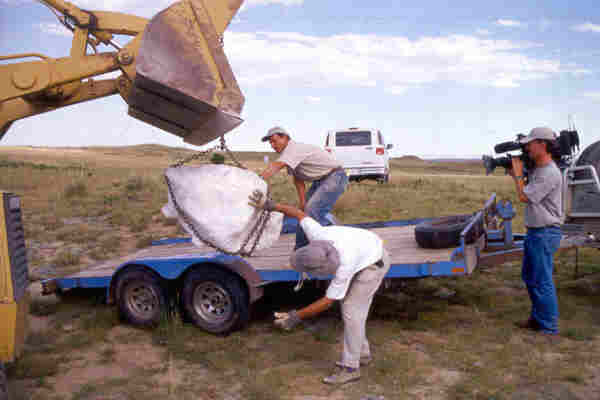 's kept any paleontological material; everything that was collected was for the University. 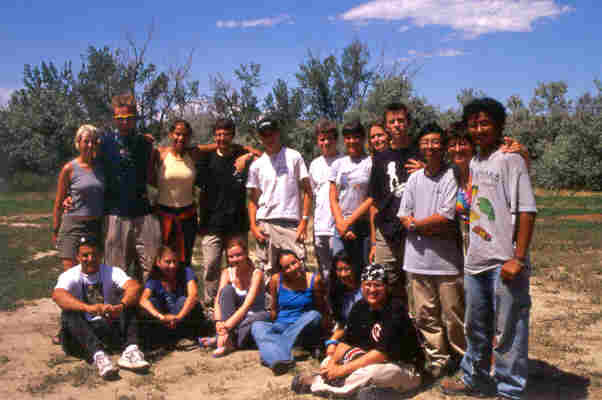 What we got was the adventure of a lifetime, more than thirty new friends, a lot of experience prospecting for dinosaurs and just a brief taste of what a long, overseas expedition is all about. We also learned a lot about ourselves and what we need and what we want. 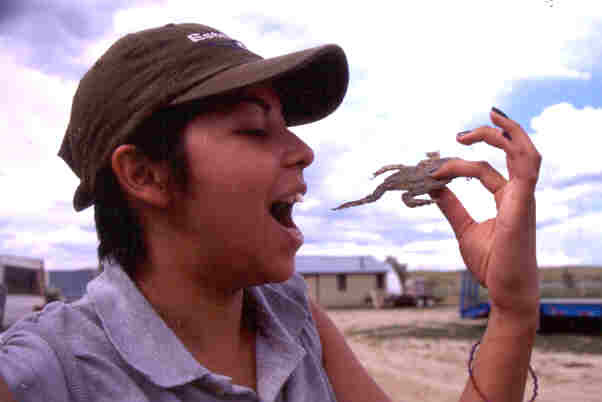 Susan pretends to eat a flattened toad mimicing a famous picture by Paul Sereno of a graduate student eating a grub in Africa. 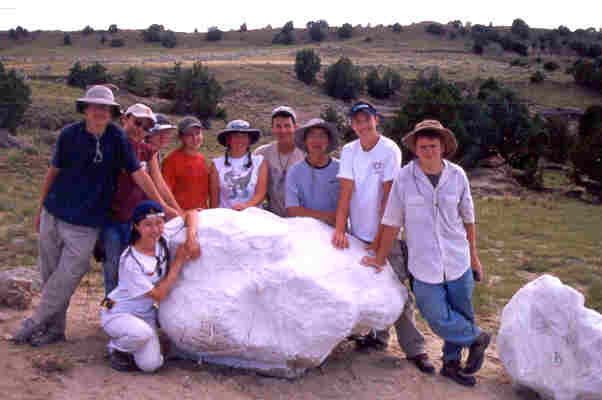 Susan, one of the Advanced Paleo Students, wrote, "I want a Wyoming life. I want a ranch, quiet, and rattlesnakes roaming the place. I want to sit out and watch the stars as I listen to the frogs croak and the crickets chirp." She doesn't get much of that in her inner city Chicago life. We learned the beauty of living far away from the apparent protection of police and other people. We learned new ways of coping in a new environment, a harsh environment where each acre barely supports 50 bugs and one lizard. We learned to imagine an environment long gone, where tyrant lizards roamed the landscape and giant herbivores feasted while turtles and crocodiles lay in the swamp and planned their next meal. We learned that there is great beauty in this harsh land and its strong people. Thanks to everyone for a wonderful adventure and I hope to see you all again! This story begins on Page One and continues on Page Two.